This '8x8 Vingnette' concept is based on the #40120 Valentine's Day Dinner and #40121 Painting Easter Eggs. It's a great way to display minifigures and show different scenes. This model is based on Stephen's iconic studio from 'The Brick Show.' 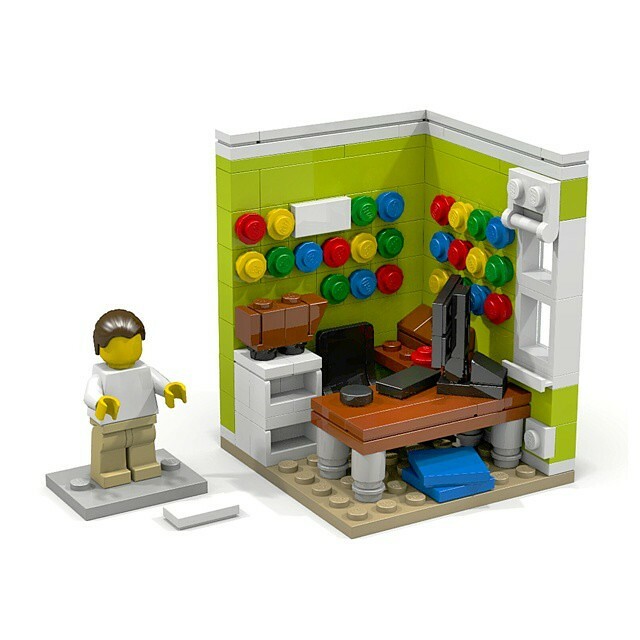 It features all the main details such as the minifigure wall, brown desk with a LEGO Apple, table with a PC monitor, spinning chair, LEGO City boxes on the floor, white storage unit with a UCS Sandcrawler and two Brick Show stickers. The Stephen minifigure needs printing of 'The Brick Show' logo as well as on the two 'Flat Tile 1x2.' It's not necessary but I feel the computer monitor should have a sticker to show the screen and the LEGO City box. Any other graphics will take away the charm of this '8x8 Vingnette' concept. I really hope you enjoyed this in MOC; feedback and criticism is much appreciated. Hey, this is in my hometown Coral Springs, and you did a darn good job! I dunno if I'd purchase it, but $20-$25 USD seems like a fair price. That's great! My son will love this. Maybe I can design a "Stephen" fig for you to use. They would love that! Excellent work! I'd be willing to pay £20.00, I think with stickers and printed torso it would definitely be worth it. epic. love the minifig wall.